When you bring out a chopping board the chances are you will be using a knife on it, however over time the knife will need sharpening to maintain its fine shape edge allowing you to easily cut through your vegetables, meat and fruit. 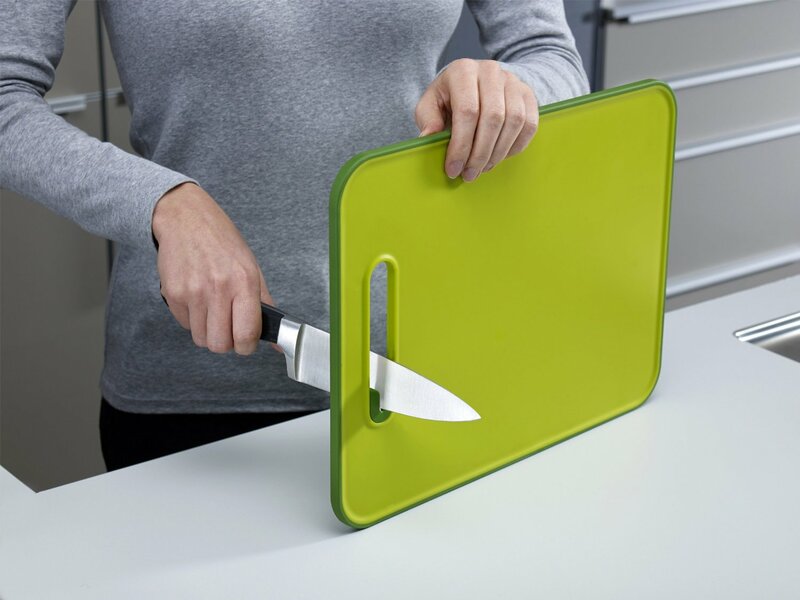 Popular kitchen brand Joseph Joseph have combined a stylish sleek chopping board with a built in knifer sharpener. When you bring out this chopping board you can quickly and easily sharpen your knife before chopping into a large slab of meat. The board features a non-slip rubber edge in a darker green which prevents the board from slipping while standing upright when sharpening your knife, and also when it is lying flat when you are using it to chop. To sharpen your knife just stand the cutting board upright, on the board is a handle cut out and within this at the bottom is a ceramic knife sharpening block that you can run the knife through. Once done ensure you rinse the board to remove any metal filings taken off the blade when sharpening. The ceramic sharpener is suitable for most stainless steel blades however it does not work with serrated blades or ceramic knives. The Slice&Sharpen Cutting Board comes in a choice of three colours, the popular Joseph Joseph green, as well as red or black. The board is BPA free and made from polypropylene and is dishwasher safe for easy care. The large board size measures 14.5 X 11 x 0.5 Inches. 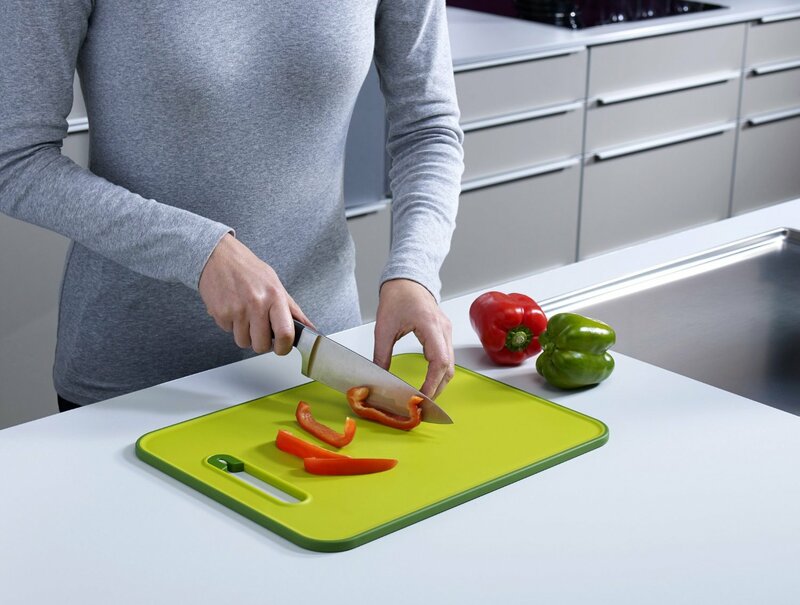 The board is good value and if you don’t have a knife sharpener already then this is a great investment, a stylish bright lightweight chopping board, rubber grab to the edge as well as a handle with a built in knife sharpener. This is a great design and works really well, if you are in need of a new chopping board then this is a great choice, and with a range of colours to choose from there will be one that suits your kitchen. As well as plastic there is also a more expensive wooden version available too which has a knife sharpener built int as well.